Then slowly, as time passes, you begin to walk out of the shock and fog and get to a place where you want to heal the hurt. That’s the time when you’re ready to look at the cracks in your marriage, before any of this happened. Affairs don’t happen in marriages with a firm and healthy foundation. It’s time to face that there was something broken, something missing, or someone really struggling for this to occur. Know this: An affair is a symptom. Sure, it causes its own new set of problems. But, it’s a symptom of a much greater issue. The affair allowed him to point to something that happened outside of himself where he could place the blame for why their marriage was in ruins. He didn’t have to look at the pieces of the marriage that had been broken for years and the role he might have played in that. Looking only at the affair kept him safe and able to play the victim role. You cannot heal what you’re not willing to look at. 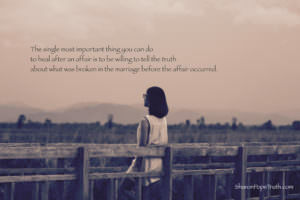 So, if you want to heal after an affair – whether you’re the one that cheated or whether you’re the one that was cheated on – the single most important thing you can do is be willing to tell the truth about what was broken in the marriage. Be willing to look at what wasn’t working for one or both of you before the idea or capacity of infidelity took root. That’s what needs to be healed. If that deeper issue in the marriage isn’t healed, the symptom of an affair could happen again (and again and again).